A day of 3 bridges…. Mile Hammock Bay where our U.S. Marine Corps Forces, Special Operations Command’s 2d Marine Battalion and Marine Special Operations School train in the waters of this bay. While we were there, we saw jeeps on the beach, helicopters overhead and heard artillery fire both day and night. The next day, we ran the waterway to one of our favorite towns, Wrightsville Beach, NC. There we dropped anchor in the harbor and took a short walk to the beach and of course, Kohl’s Frozen Custard parlor. Boat buddy Reuben loves ice cream as much as Hayden does! We love places where we can anchor the boat and dinghy into town and walk to a beautiful beach, Wrightsville Beach is this kind of place. Figure Eight Island Swing Bridge, The bridge tender is in the house top center! Beaufort is one of our favorite stops every year as we travel up and down the AICW. It is a very nice waterfront town with cute shops, pubs and restaurants. But for us, the real joy is visiting Greg and Kate and their lovable Doodles, Lucy and Gracie. Greg and Kate make us feel like family and their hospitality is like none other. We visit their home, play with the Doodles, and enjoy the most amazing meals home cooked by Kate with Greg’s assistance. We drink fine wines, bubbly, dessert wines and home brewed espresso made from freshly roasted beans! OMG, can it get any better than this? Nope, it cannot! Kate and Greg always spoil us and make us never want to leave, but with a plan to arrive Charleston Nov 3, we need to move on. Thank you so much, Greg and Kate, you truly are amazing with your hospitality and we cherish your friendship. Beaufort is Home, and you guys are family…. Here are some photos of our wonderful days at Greg and Kate’s. Oh, did you want freshly brewed espresso? No problem! How about a homemade Apple Cheese Tart? Really? OMG, I am moving in! Playing ball with the Doodles. Lucy always wins, but Gracie gets there first! Day 2: Radeen and Kate heading out for dinner at the Ruddy Duck. Notice Radeen’s beautiful necklace hand crafted by Kate. It has hundreds of tiny black and green beads and took 30 hours to make! The Team out for dinner on night two. What a fun time! The Clubhouse at the Dunes…. topped with goat cheese and walnuts, and a homemade cocoa pudding. River Dunes is a great place to dine out. The chess match after dinner, Radeen won! Great job, genius! So, we will continue south today and our next stop (if you can believe it) will be even BETTER than River Dunes! We will see our great friends, Greg and Kate and the Doodles Gracie and Lucy at Beaufort, NC. We NEVER, EVER, EVER miss an opportunity to visit and enjoy their wonderful hospitality and Momma Kate’s home cooking! Did we mention their fabulous home cooking?? YAHOOOOO….See you soon, Greg and Kate! We had a great run south out of Elizabeth City, NC, sailing across Albemarle Sound and down into the Alligator River where we dropped the hook. That was an 0830 to 1730 day, but it was a beautiful sailing day. The next morning, we upped anchor at 0700 and entered the Alligator Pungo River Canal with NW winds. The forecast was for 20-25, but it turned out to be mostly 25-30 with several gusts to 34 knots. The bow wave was coming over the starboard bow and the spray was flying into and over the dodger windshield. Saltwater was running horizontally across the windshield due to the 30 knot winds. Our buddy boat, IP 380 PRIORITY, with Reuben at the helm is amazing, as he is single handing his boat along with us! He is one tough sailor and he is doing a great job. SP Cruiser Catspaw Carey would be very proud of him! With the winds now on our stern quarter, we rounded into Pungo River and turned south. rolled out jibs and motor sailed at max speed as we were trying to make a 70 nm day today! With 30 knots on the stern and 1500-2000 on the engine, we were doing 7+ knots all day long. We actually made 68.9 nm in 10 hours, so our average was 6.89 knots of speed! The prize at the end of this long day was the beautiful marina called RIVER DUNES. This is a must stop on your way south as the facilities are spectacular. 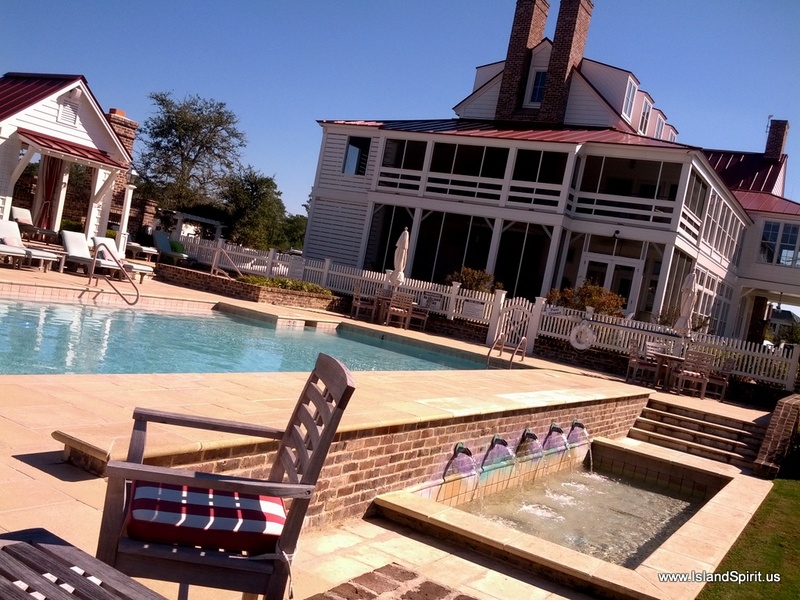 They provide WiFi, fire pits, clubhouse with coffee and TVs and sofas, pool, showers, pool tables and a laundry. All the essentials for a cruiser, and all for $1.50/foot and two for one days! While here, we all need to clean up our boats, fix various items and enjoy some down time. Job #1 & #2 for Team Island Spirit: Laundry & Windlass repair. Here are some photos to share the adventure. Sharing the canal with a tug and barge! River Dunes, NC. What a great place to take a break…. This sunrise was taken (75 total photos) out the galley porthole of our sailboat using my old Canon Digital EOS 30D and a 18-55,, lense. NOTE: Click the image for a larger 1024 x 768 full screen image. Have a beautiful day! Pressing on today and departing Elizabeth Cith, NC for the Alligator River, where we will have to anchor before the Pung Pungo canal of 22 miles. We can’t anchor in the canal, and we can’t make it from here to the other end in daylight, so we anchor just before the canal. Radeen, master of the lock…. A photo essay of today, Oct 19, 2014. Deep Creek Lock to Elizabeth City, NC. This is a beautiful section of the AICW. I hope my photos show the true beauty. The Dismal Swamp is not dismal, at least for us to travel by boat. I imagine it was very dismal to dig this canal by hand, but today, it is one of our favorite passages on the east coast. The Chesapeake Bay Great Schooner Race took over both Portsmouth Ferry Basins, so we fueled up and pressed on to the Deep Creek Lock and into the Dismal Swamp Canal. Once in the canal, we decided to take Robert’s dock, just out of the lock in the swamp. This dock allowed all three of us, IP380 PRIORITY and IP38 MOONDANCE to tie up and enjoy the later afternoon and evening together, complete with dinner and great conversation aboard MOONDANCE. Tomorrow, we will run the 22 mile canal and exit at the South Mills lock and continue for 19 miles of the Pasquotank River to Elizabeth City, NC. If all goes well, we should arrive Elizabeth City by 5 pm. Otherwise we will simply drop an anchor and spend a night on the river. The weather is perfect, we are so lucky to have mild weather and no storms. So, tonight, we will stay here in the Swamp and tomorrow we will run to Elizabeth City. This is a new schedule for us as we were thrown off by the schooners taking the ferry basins. So, no movie theater but we have great friends and a peaceful place to spend the night. You can run the Chesapeake Bay in 24 hours or less, nonstop overnight, or you can anchor each night and then it may take three or four days. Then again, you can spend a lifetime sailing and exploring the Chesapeake Bay. We have sailed this bay since 1986. Now it is a large body of water we must transit to make our way south to Florida and the Bahamas. This bay is comfortable, familiar and we love it. When we return, we always feel at home. Going south, it feels large and it is a real task to break free and to reach Mile Marker Zero of the AICW, the Atlantic Intracoastal Waterway in Norfolk, VA. This year we have a great friend traveling along with us on his IP380 PRIORITY and we also have reconnected with our Bahamsa buddy boat, IP38 MOONDANCE. With Reuben and Bob and Nina along, this trip is even more fun. Cruising is always about the people you meet. This is what makes is so much fun. After the fun of the Annapolis Boat Show, we blasted out of town at 9 a.m. and pointed our bow towards Solomons Island, MD as the weather was going to turn against us. We stayed there for two days as we waited out the frontal passage. This delay was made MUCH more fun because Ron and Mary Ann of IP380 CAVU live there now. Even though they were busy with their own boat, they picked us up for lunch at the Pier, took us for provisions and brought delicious treats to a cruisers’ get together on the porch at Zahniser’s with Reuben of IP380 PRIORITY, Mark and Margie of IP38 TATTOO II and the crews of several other boats including Solevig and Dragonfly. Sorry we have no photos of all the fun. Thank you, Ron and M.A., for everything! Now, we are fortunate to have 10 days of dream weather ahead of us to make our way south. Beaufort NC, Greg and Kate’s….OUR BUDDIES! Our goal is Charleston, SC, by about Nov 3 where we will dock. For now, we will enjoy the southern end of the Chesapeake Bay and beyond. Here are some photos of our travels. We call this SUN GLARE and RUSH HOUR on the boat. We call her YANNIE-NEW and she is running very well. She had her 25 hour oil change tonite. Some have asked us, is it still that much fun? We can’t believe it, but it IS FUN, it is WONDERFUL, it is adventurous, and we really feel fortunate to be able to live this dream! Florida here we come, Bahamas here we come…..
We moved onto the boat Monday, provisioned and prepared Mon/Tue, then departed Wed AM for the Annapolis Boat Show. We arrived at 2pm, picked up our good friends Craig and Liana from the fuel dock and turned around for an afternoon of sailing out on the Severn River. We were lazy and just used a jib to run downwind and then we sailed close hauled back upwind. It was a nice afternoon of sailing, one of our first sails of the entire summer. Wednesday afternoon around 5 pm, we docked at the Annapolis Yacht Basin, our home during the boat show from Thursday to Monday. Each day of the boat show, the Island Packet Fleet of owners gather on the roof of the Navy Fleet Reserve at noon. There the Island Packet Owners find each other via our IPY stickers and gear, then we all enjoy the great Pit Beef Sandwiches together. What a well connected fleet we have. Thursday we had 15 people attend, Friday 19 people attended and Saturday 28 people attended, along with the VP of Island Packet, Bill Bolin. Sunday, 7 people gathered and Monday we plan to sail on. Thanks go out to our IPY dealer, WHITEAKER YACHT SALES for hosting the Saturday Pit Beef day. Ed and Debbie Whiteaker sponsored our gathering and bought Pit Beef sandwiches for the first 30 people to register. WOW, that was very generous. Thank you, Ed and Debbie! We really appreciate this support. So, our boat show time was filled with meeting and connecting with Island Packet Yacht Owners every day from noon til 2 p.m. Then we would tour the show, attend parties, and board new yachts. Radeen and I represented Whiteaker Yacht Sales as their broker at the Island Packet Dealer meeting and enjoyed the presentation of the IPY Dealer of the year: Island Yachting in the Virgin Islands, congrats to Skip and Andrea. The Blue Jacket Dealer of the year was Springline Yacht Sales, congrats to Rick and Kimberly. What a fun night to attend this Island Packet Yachts event on the docks after the show closed on Thursday. Thank you Bill Bolin for including us. Now, it is time to review the weather, and plan our run Monday from Annapolis to Solomons, MD. This is a 44+ mile run, which will take 7+ hours. The winds are expected to build Tue and Wed and be near Gale Force, so we plan to stay on anchor in Solomons Island until that dies down. We may not be able to move on until Thur. Solomons is not a bad place to be stuck, plus we have great friends there, IP380 CAVU, Ron and MA. So we may be able to see them again. Here are some of the best photos of the times here…. Hayden with Michele of S & J Yachts, what a dear friend! Let the tun to Miami, Florida begin! It takes 25 days of 8+ hours per day to make daylight legs to Florida. If we go offshore, we can cut down on that time. Our Goal: Get the boat to Florida to store it, so we can fly to family in AZ for Thanksgiving week.